Attic conversions are a great way for those who cannot afford to build a room extension due to logistical or financial reasons. Extending into the roof space is a growing option for an increasing number of home owners. Moreover, an attic conversion can be a wise investment for those who may wish to sell their home in years to come. 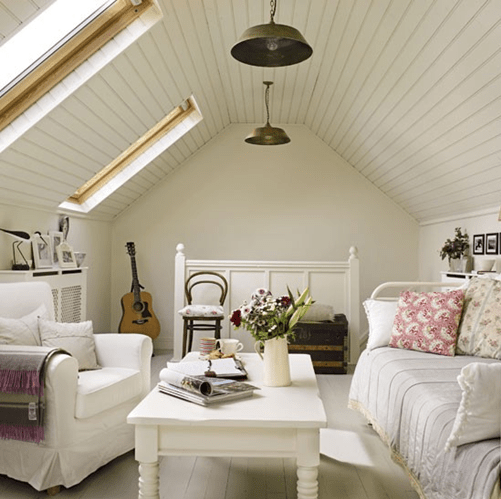 We’ve scoured the interwebs to give you fresh ideas on how you can transform a livable attic into a beautiful extra space. This craft room is extremely cute that we want to step right in and do some scrap booking. If you have guests coming over for a few days, you don’t have to give up your bedroom if you don’t have extra space. Your attic will do just fine. If you love quiet afternoons and good books, your attic could be the perfect reading nook. You don’t have to build a new entertainment room for a growing family. Check if your attic has enough space to put some comfy furniture and a TV. Since the attic is the least visited part of the house, it can be an ideal study room. If you are working or running a business from home, transforming your attic into a vibrant home office is a good investment. Do you need help converting vacant rooms into functional living spaces? Call us today or email us at info@prepthishouse.com.